Konami is one of the most legendary videogame editor. 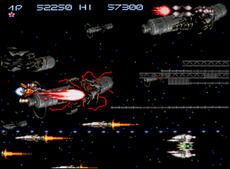 The company became famous in the early eighties, mostly among arcade and computer players, and of course a few years later with the NES. 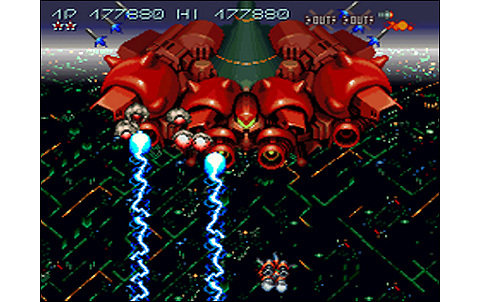 This success occured with a bunch of great games such as Contra, Metal Gear, or some revolutionary Shoot them Up like Gradius, Salamander and the funny Parodius. The japanese had in its time some of the best programmers, designers and musicians of these times. 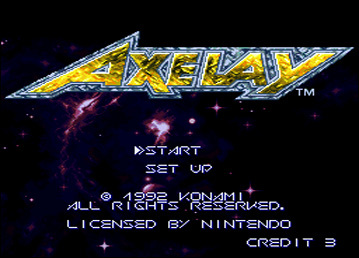 Axelay is a soft that not only features a prestigious distribution, but also gets the use of the excellent capabilities of the Super NES: so let's not hide it anymore, the game looks great. Axelay's originality lies in its action. It alternates between horizontal and vertical scrollings from one stage to another. 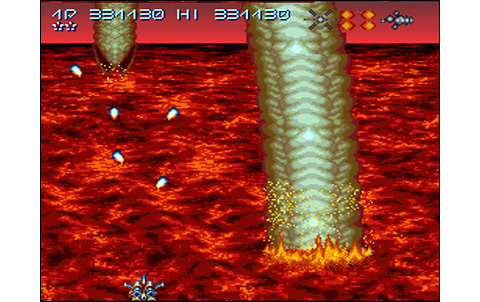 While horizontal ones occur in the manner of R-Type, the vertical scrollings are made with the use of mode 7, giving an embossed effect to the landscape. Almost like if we were flying over a planet while distinguishing its curve. This feature is successful and brings freshness and dynamics never seen before. 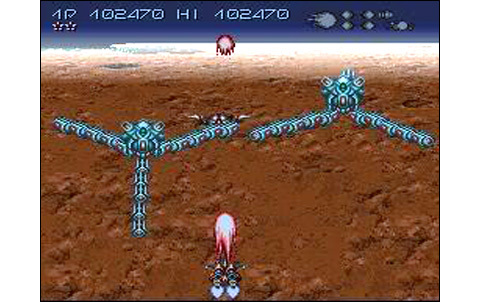 The scrolling also vary in speed, while the playing area can be several screens large in one direction or the other, leaving a great freedom of movements. The six stages are all exotic landscapes. From a cloudy planet, you'll go for a starbase attack, then fly over a city of the future, then a lava planet... Each course has its own enemies, thus offering a nice diversity in the bestiary. 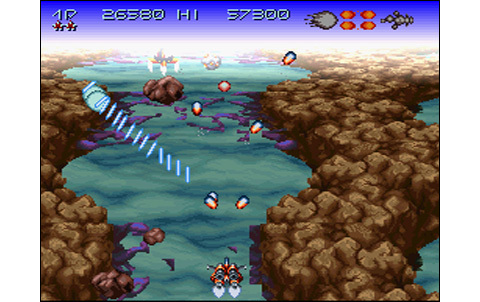 Although some backgrounds are somewhat empty, the graphics are successful in Axelay, attention to detail is palpable and the scenery remarkable. 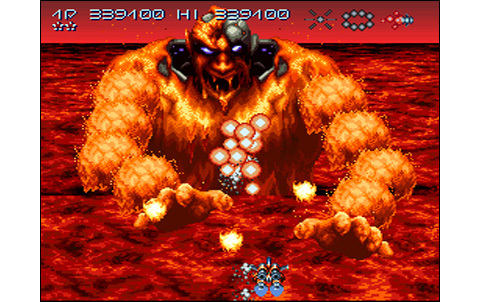 Enemy sprites are just as finely drawn, and it's the same for the Bosses which are the apotheosis of the game. We had never seen such big (and beautiful!) ones on the Super NES before. 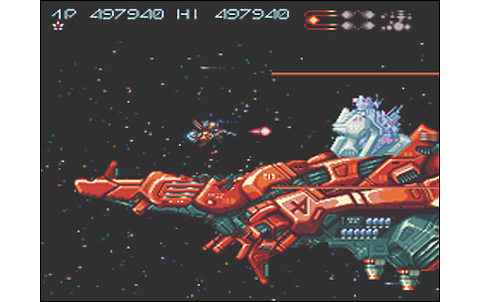 Moreover, this is where the machine shows its limits: the animation suffers from this presence of huge sprites, and also the multitude of shots and enemy vessels: some slowdowns and blinkings are occuring all along the game. Konami has done its best, and anyway these are sporadic and not too punitive for the gameplay. About the musical themes, I can only encourage you to listen the whole sountrack of the game, as the compositions are simply sublime. These are epic and masterfully orchestrated, it's great art. The sound effects are excellent too and game even features vocals in its 8 Mb cartridge! Now let's look for the highlight of Axelay: the gameplay. 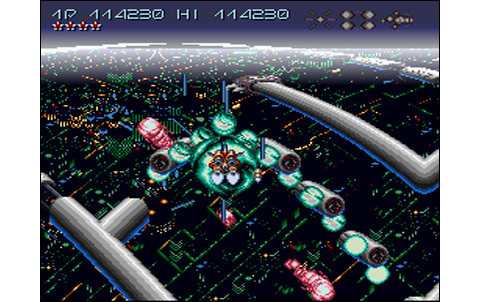 Besides the variety due to its alternating stages, the game offers a comprehensive and quite strategic weapon system. 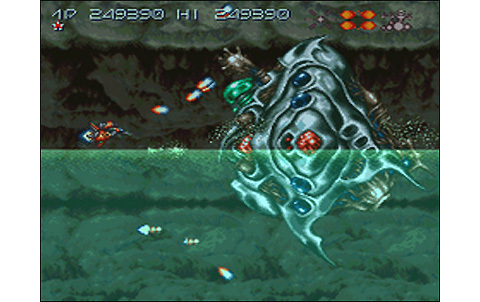 The vessel can be equipped with three different weapons. 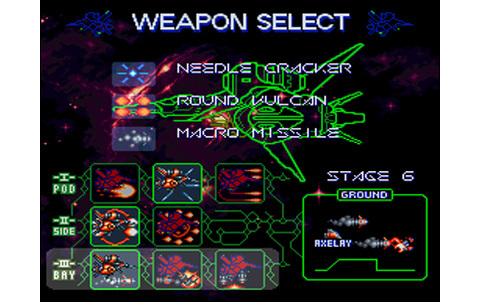 At the beginning of each stage, you can pick whatever you want in the arsenal, which widens gradually as you progress through the game. With the L and R buttons, you can switch between the three arms selected at any time, in order to use the most effective firepower depending on the location. 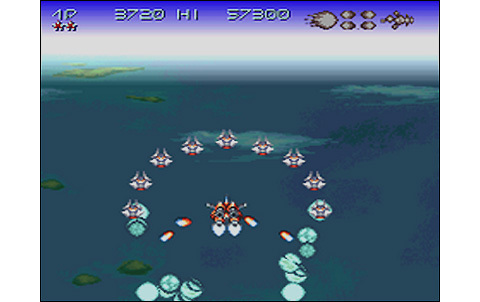 Each enemy fire destroys the weapon in use: you can suffer up to three enemy shots before you're left only the basic canon: with the next shock, the ship is destroyed. 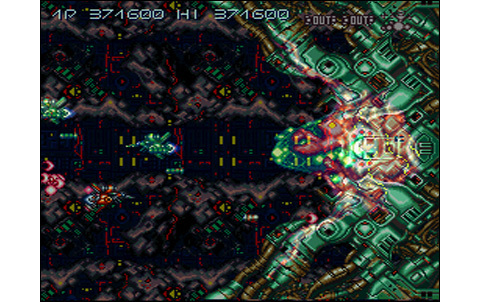 In case of contact with a structure, another ship or some plasma shots, the ship is instantly shattered. 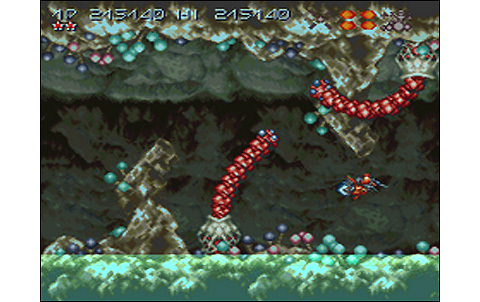 You're taken back from where you died as long as you have lives, but the use of a credit sends you back at the beginning of the stage. Axelay is a good challenge, with a well measured difficulty and addictive gameplay, but unfortunately tends to be a bit short: we quickly come to the end of the six stages, and there is no cooperative play to raise the replay value. 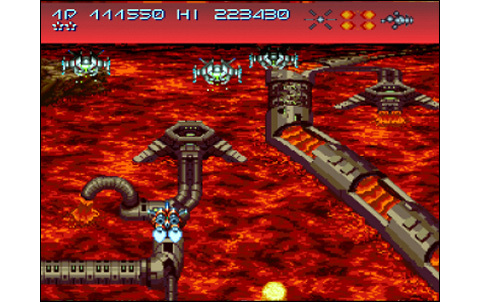 The one-credit clear seems to be a good challenge, for the fans! 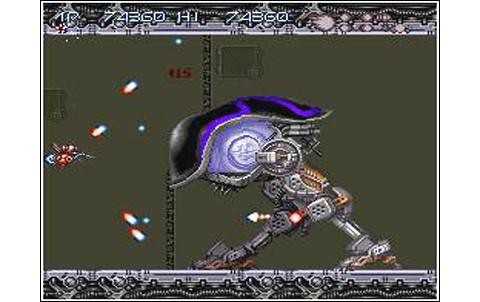 Konami signs here one of the best Shoot them Up of the of the 16-bit era, despite a life a bit limited and an imperfect animation, with the system operating to its limits. 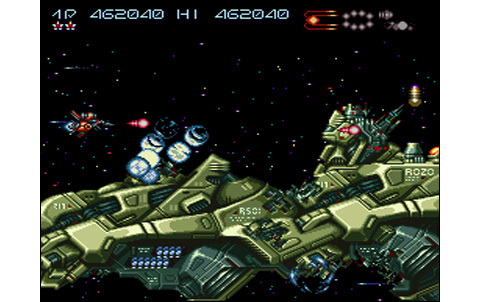 The Super NES is programmed near perfection. 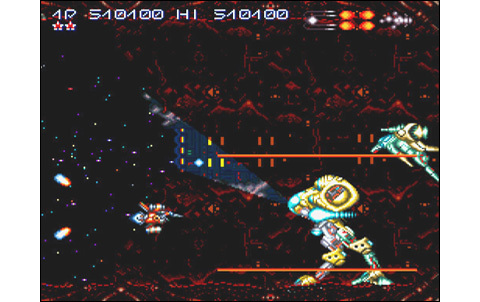 Alternating vertical & horizontal stages provides great variety and graphics are awesome. Taro Kudo's themes can be considered as part of the best videogame musics ever, it's pure art. Effects are perfect, what can we say more? This soundtrack is almost perfect! 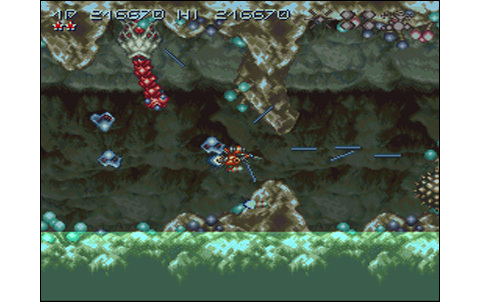 Six stages, only one player , and an average difficulty. Axelay makes Par here, but seeing the rest, it's clearly not the strength of Konami's game. 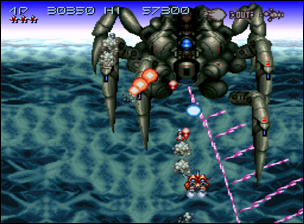 Weapon choice, alternating vertical/horizontal intense action, great controls... Bravo! An amazing Shoot them Up, which doesn't make it to the Mega-Hit status because of its short life and too flawed animation: Anyway, Axelay stands as a splendid masterpiece. 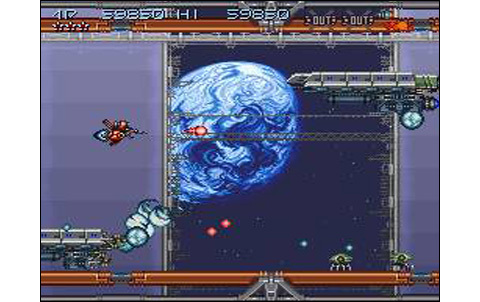 Andro Dunos released the same year packs a selectable weapon system too, albeit we are more encline to think about Pulstar or Last Resort for their atmospheres, more related to Konami's title.